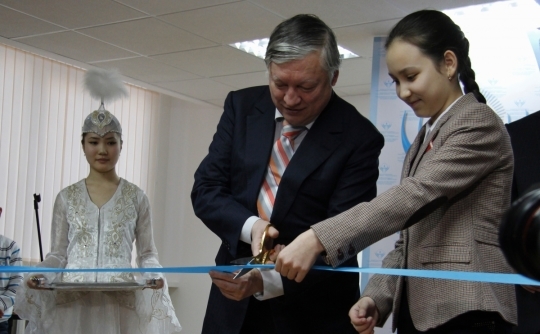 The 12th World Champion Anatoly Karpov visited Almaty in Kazakhstan to open the newly established Zhansaya Abdumalik Chess Academy. Karpov and Abdumalik also played a four-game match after the ceremony. Karpov won both rapid games (20 minutes per player), while Abdumalik won one blitz game and the second one was drawn. After the match, Karpov praised the defending abilities and tenacity of his young opponent. He advised that there is a lot of hard work ahead of Abdumalik. He said that she should keep her focus, expand the opening repertoire, find an experienced trainer and compete regularly. Zhansaya Abdumalik’s next tournament will be Tradewise Chess Festival in Gibraltar.